How do you make a group of Mustang enthusiasts scream like little girls before boarding the downward spiral to a complete and total frenzy? Free dyno pulls. And American Muscle did just that at its July 19 car show. 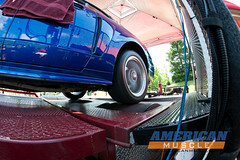 Finding the dyno at the show was easy. Listen for the sound of a throaty V-8 powering its way to redline and back, then follow the thunder until you see a large crowd of mesmerized Mustang owners. With the first car on the dyno at 9am, and 19 more lined up and ready to go within minutes, American Muscle, with the help of Axcelerated Motorsports, gave 20 cars two pulls each, and then had time for 10 more cars. At the end of the day, Mike Baer took top honors with 454 horsepower from his ’04 MystiChrome Cobra convertible. Congrats Mike. But don’t let it go to your head. How much power is in your pony? And what do you most want to do to get more out of it? You never know when the American Muscle Gift Pony may stop by your garage with a few hand outs. Great write up. I’m trying to not let it go to my head , but it’s tough. If that gift pony stops by ,maybe I can get over the 500 mark NEXT YEAR ! Again GREAT SHOW ! Great lookin car mike and congrats on the numbers!